When you're looking at a new Subaru for your Utah adventures, it can be hard to discern what sets apart one model year from the next. We've put together information on critical features and performance to help you determine what makes the new 2015 Subaru Outback different from the 2014 model. Read on to learn about the additions and changes that make the new 2015 Subaru Outback unique. The new 2015 Subaru Outback makes improvements on the features that the 2014 model got right and adds key updates to make the 2015 Subaru Outback an incredible value. Both the 2014 Outback and 2015 Outback models have symmetrical all-wheel drive, Vehicle Dynamics control, anti-lock brakes, and other safety features in common. The 2014 Subaru Outback had an available suite of driver-assist features- the 2015 Outback adds previously unavailable Blind-Spot Detection with Lane Change Assist and Rear Cross-Traffic Alert, upgrades the EyeSight® system, and integrates a standard rear-view camera. Unique changes for the 2015 Subaru Outback also include roof rails with crossbars that adjust fore and aft, an optional power tailgate, available 18" wheels, standard touch-screen infotainment, and more. With slight changes in design, performance, and efficiency, the new 2015 Subaru Outback makes improvements that you'll love. The 2015 Outback improves visibility with new in-door triangle glass and improved A-Pillar placement for greater windshield views. Subaru also added 1.2 cubic feet of cargo room with the seats up and 2 cubic feet with the seats folded down. The new 2015 Subaru Outback makes key power train improvements over the 2014 Subaru Outback, with horsepower increasing to 175 in the 2.5-liter engine, highway fuel economy improving to 33 mpg, and a continuously variable transmission is now standard on all models. The performance enhancing X-Mode and Active Torque Vectoring system were unavailable on the Outback and now come standard in the 2015 Outback. You'll feel the difference when you test drive the new 2015 Subaru Outback at Nate Wade Subaru. 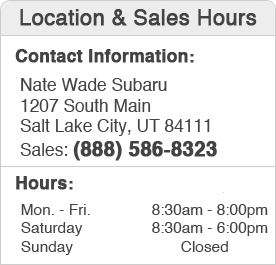 Nate Wade Subaru is your proud full service Subaru dealer. Making a decision on your next vehicle is now even easier with our 2015 model research and 2014 model pages. Our team of dedicated sales professionals will be happy to help you find the perfect Subaru vehicle for your needs in our new 2015 and 2014 models and quality pre-owned inventory. We'll help you maintain your Subaru at our state-of-the-art service department or help you find the genuine Subaru parts and accessories you need at our parts center. We offer great savings with our new Subaru specials, service discounts, and parts coupons. When you're ready to take the next step in owning a Subaru, give us a call at (888) 586-8323 or visit us at 1207 South Main, Salt Lake City, UT 84111, just a short drive from Taylorsville, Holladay, and Sandy, Utah.